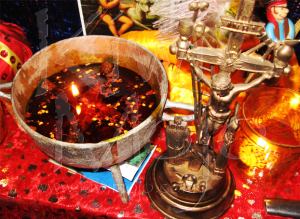 One of the most important lwa in the reglemen of Haitian Vodou is the Master of the Crossroads, Met Kalfou. Kalfou is the Kryeol version of the French word “Carrerfour” meaning crossroads, specifically referring to a point where four roads emanate from. With this understanding of the word comes the understanding of the manifestation of Met Kalfou. He is quite literally what his name explains, he is the crossroads. In this way Kalfou is one of the most universal of all the lwa. Where four roads emanate from a single point, there is Kalfou, be that two roads crossing, or the crossing of two tracks, or paths, that is the manifestation of Kalfou. Met Kalfou is a strong and powerful Petro lwa who is fundamental to all Vodou liturgy and magic. He is served in the red of the Petro rite accented with black, and this is the first sign of how strong, hot and powerful this spirit is. Red and black is also the colour manifestation of two of the secret sosyetes within Haiti, both of which are focused on the manifestation of magical work (called ‘Travay ‘ in Vodou). As a hot spirit he eats only blood from his sacrifices, however as an offering he will accept other foods, such as cakes and red apples, and these are often used to “cool” Met Kalfou down after working with him. Whatever food is given to Met Kalfou, is should be red or red and black, as he reaps as much pleasure from looking at these offerings as anything else. Make sure they are aesthetically pleasing and presented in an even number and a multiple of 4. If you are offering him apples, offer him 4 or 8 or 12 or 16 apples, never 3 or 5 or an uneven number. His preferred drink is a special Vodou mixture called Kiman. Kiman is a drink that begins with white rum, preferably white Barbancourt, to which Star Anise, Cinnamon and other herbs are then added. The exact recipe for Kiman may vary from house to house, but this drink is the most common drink given to lwa of the Petro nation as it is hot and fierce and heats them up to work, or manifest in possession. There are many ceremonies and travay that are performed on the point of Met Kalfou. He is a “gad” spirit and so a pwen of him is often given to people in a very specific ceremony which provides protection from harm. A “gad” is exactly what the word sounds like, a “guard”, and through the reception of this pwen or gad, the recipient has the protection of Met Kalfou over every aspect of their lives. Met Kalfou is also extremely important in the “liberal” ceremony. The liberal ceremony can be done for a number of purposes, although most often it is done at the conclusion of the Lave Tet and Kanzo ceremonies on behalf of each of the initiates. The spirit Met Kalfou is often mistaken as the “devil” or with some kind of demon or evil. One of the most common misconceptions about Met Kalfou is that he is evil or that he is involved with evil. These demonic associations come from Met Kalfou’s manifestation in magic and magical work. Kalfou is the true essence of all magic, he is the force through which all magic flows, or to put it another way, all magic, be it for good or ill, passes through the crossroads. The crossroads is the point upon which magic manifests, regardless of which lwa the magic is working with. It is not Kalfou that directs negative magical work, he is simply part of the way that it travels, and he allows it to travel without judgement. Think of it this way: a crossroads does not stop a car from passing through because it does not like the colour, the crossroads is simply part of the journey and cars use it to get to where they are going. The same is true of magic, Met Kalfou does not judge that magic that passes through him, he simply does what he is called upon to do. Met Kalfou however is a great sorcerer in his own right, and he works great and powerful magic. Contrary to popular belief, he is not obsessed with nor commonly associated with black magic. Met Kalfou, like all lwa, carries the morality of Ginen and this is something that for himself he upholds. However, he can not enforce that morality on to others. Indeed, as with all the spirits, they are bound by the knowledge that as humans we have, by Gods Divine Will, the manifestation of free will. So, if people send work for good through the crossroads and it is conducted correctly, this is what Kalfou manifests, if it is work for ill, then that too is what Kalfou manifests. One can not blame the crossroads when someone crashes, that responsibility falls firmly upon the motorist. Another common misconception is the Met Kalfou is the Petro form of Legba. This is also not true. Legba in the Petro rite manifests as Legba-nan-Petro, while Kalfou comes slightly later in the reglemen. Met Kalfou is not the gatekeeper of the Petro rite, but rather is the point where our journey can split. 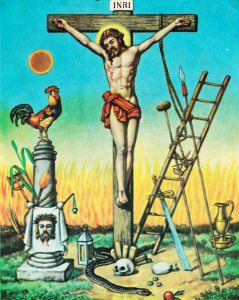 The Vodou reglemen is formed on a road (the great Lwa Gran Chemin – literally the Great Road). When we begin a Vodou ceremony, we begin by invoking Gran Chemin – the great road that we will walk along. Gran Chemin takes us along to the door to Ginen, where Legba unlocks the door for us. Next we pass by the Marassa, who ensure the manifestation of Ginen within the rites, and then to Met Kalfou. From here we make a choice which road to travel, perhaps we will head right and journey the road of Rada, which will eventually lead us back to the door of Petro (where Legba-nan-Petro will open the next door), eventually leading us back to Kalfou who can then direct us along the road to Petro. Despite all the stories that go around, Met Kalfou is a spirit of luck. When he manifests in possession in Hounfo Racine Deesse Dereyale he greets each individual with the words, “Bon Chans!” meaning ‘Good Luck!’ This is his blessing with all sincerity. Depending on the environment in which he mounts, and what he is being called for, Met Kalfou will also often roll around on the ground, sometimes simple rolling around, at other times moving in the form of a cross, or even doing somersaults. When he interacts with people, he is very direct, he does not suffer fools, but when treated with respect, Met Kalfou is a powerful lwa to have on your side. Met Kalfou is a wondeful lwa with which to consult. Many of the consultations with the lwa at Hounfo Racine Deesse Dereyale are done with Met Kalfou in possession, as he enjoys conversing with people and is eager to offer assistance to those who request it from him. He sees very far forward, and as a a manifestation of the crossroads is able to see multiple outcomes to a situation dependent on the various actions taken by the person he is consulting for. 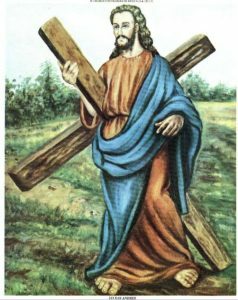 If we ask him nicely, he will push us through the crossroads in the direction of luck, however he can just as easily push us to the centre and leave us to find our own way out, which may lead to ill luck or even danger. That is why it is important to petition him under the guidance of a Houngan or Mambo who is experienced with him. Once you know him well though, he is a pleasure. Met Kalfou is a regular visitor to Hounfo Racine Deesse Dereyale, and amongst our family he is always welcome. Without Met Kalfou along Gran Chemin, the Great Road, many of the lwa would not know the way to come in possession. Met Kalfou brings other lwa to the peristyle, an important and vital road. The great miracle of Vodou is that we are able to interact with the lwa via the mechanism of possession, and without Kalfou this incredible gift would not be possible. Met Kalfou is one of the most important lwa in the reglemen of Haitian Vodou, and we would get no where without him.